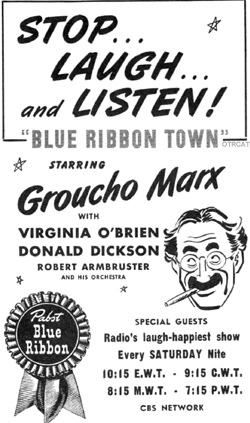 Pabst Blue Ribbon Beer brought you Blue Ribbon Town with Groucho Marx. 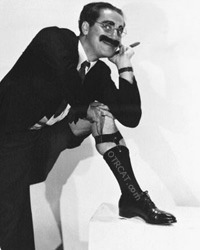 According to John Dunning On the Air: The Encyclopedia of Old Time Radio, Groucho had yet to find his "radio legs" with Blue Ribbon Town. Many of the jokes were dated at the time and reminiscent of his films featuring quick skits and one-liners. To modern audiences and Marx Brothers fans, this adds considerable charm to the show. The February 12, 1944 airs from the Shrine Mosque in Peoria Illinois. The episode featured 100th Anniversary of the Blue Ribbon Town radio show and featured what America will be like one hundred years in the future. Blue Ribbon Town featured big name guests like Jack Benny, Barbara Stanwyck, and Gene Tierney. See also: Marx Brothers Collection. Be the first to comment on "Blue Ribbon Town"